Refresh yourself with the soothing Gulf breezes at Sugar Sands. Designed as a true Destin Florida vacation cottage with 4 bedroom, 4 and a half baths, it is located in the heart of all beach activities in the popular Crystal Beach section of Destin, and is just a short walk (approximately 250 yards) to the white sandy beach its name reflects. This NEWLY REMODELED Destin FL vacation rental home offers your family or group comfort and privacy along with your own private pool for the vacation of your dreams. For those of you who do not want to climb stairs, this 2,856 square foot house is for you. Bask in the convenience of your living, dining and kitchen being located on the first floor along with a queen bedroom with private bath. The second floor houses the master king suite, with jetted garden tub, and double vanity. Plus, there is a queen bedroom suite with 2 queen beds, and bunkroom with twin on top, full on bottom with community bath. 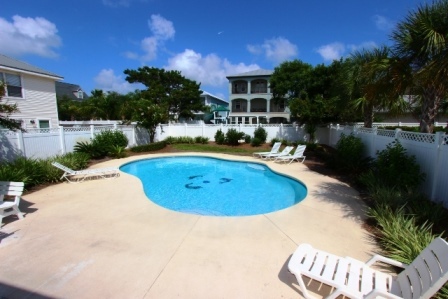 The queen sleeper in the first floor living area allows you to accommodate eighteen people comfortably in this Destin vacation rental property. After a full day on our sandy white sugar beaches and the emerald green waters of Destin where the sun shimmers off the water, sit back and enjoy the scenery from one of the decks, screened porch, or air-conditioned third floor turret. What better way to enjoy the scenery than sitting by your own private pool. Here you’ll enjoy a refreshing stop to cool off and swim among the tropical foliage. Not ready to relax, take a short walk to Destin Commons for shopping, entertainment or dinner or jump into the car for a short drive to one of the top rated outlet malls in American, Silver Sands. This Crystal Beach vacation home offers one of the best and easiest ways to experience Destin’s walking trails, bike paths, neighborhood restaurants, entertainment and more. Golfing is close by for those who want to play when on vacation. Check out the golf courses by clicking here. Come stay with us at Sugar Sands, admire nature’s handiwork, and make memories to last a life time!